Furs and Shawls - Wedding Ideas. Weddings happen everywhere, every time of year, so for brides in colder climates, options like furs (faux, of course!) and shawls to keep warm are a must. And there are a plethora of fashionable accessories that complement wedding gowns and keep the chill at bay. White is a no-brainer when it comes to wedding colors so this white fur jacket is a great accessory. It’s fluffy, chic and perfect for a winter wedding. This bride opts for a light brown fur jacket. The neutral color would pair perfectly with any gown and evokes timeless style. This bride dons a dark brown fur stole. With her light bouquet, auburn hair and dramatic gown, the simplicity of her accessory offers perfect balance. It’s not just brides who need to keep warm! 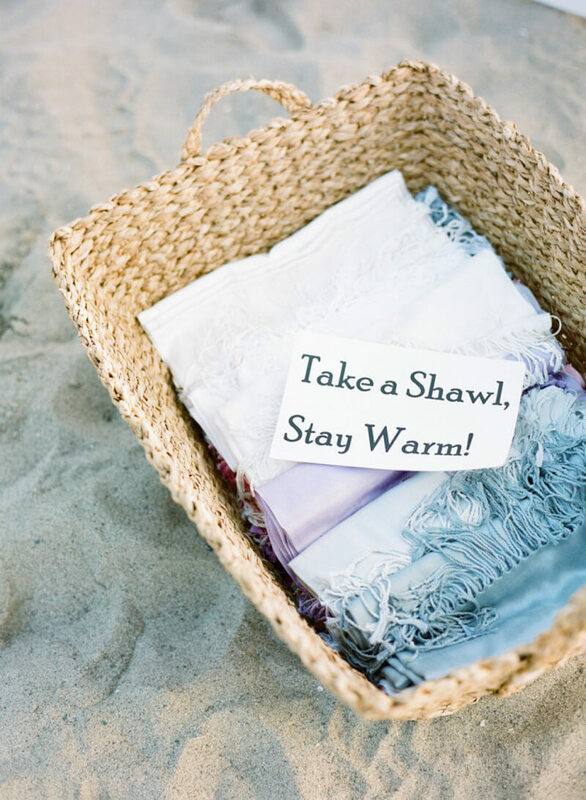 If your event may be chilly or windy, offering shawls in a woven basket for guests as they enter is a thoughtful touch. This bride’s color palette included cream and green; therefore, she gifted her bridesmaids with dark green pashminas. The bold color is stunning next to their light dresses and exquisitely combines the colors of their bouquets. All the ladies in a bridal party can wrap up in a special way. The bride dons a light brown fur jacket while her bridesmaids all match in red shawls. The contrast and coordination with the wedding color palette is impeccable. Even if you're indoors for most of the event, grab a wrap and head outside for a few photos to capture the spirit of your wedding. Let your bridesmaids join in on the fashion fun, too! Take the opportunity to embrace the cold and bundle up in true bridal style.